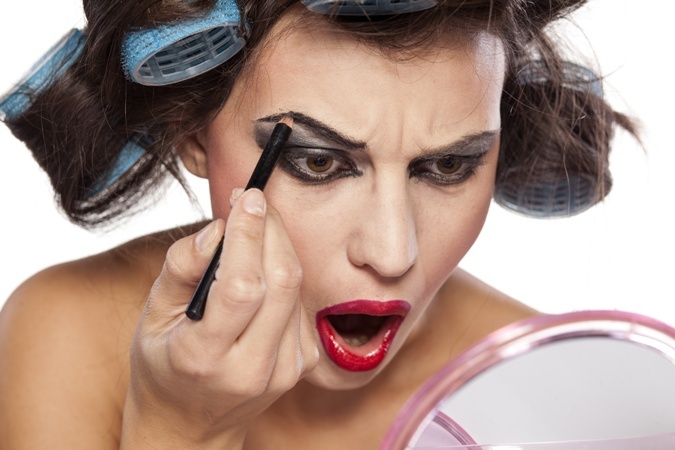 Makeup in the workplace, can your boss tell you what to wear? Or how you should dress or groom yourself while in the office or your job? Yes, they can! Emily Jane Perkins , a third-year law student at Northern Illinois University College of Law in Dekalb, Illinois, and a contributor to The National Law Review, relates the case of a casino employee who filed a sexual discrimination lawsuit against her employer, Harrah’s Casino, and lost. “Harrah’s adopted an appearance policy entitled the “Personal Best” program, where bartenders were required to be ‘well groomed, appealing to the eye, firm and body-toned, and be comfortable with maintaining this look while wearing the specified uniform,’” she explains. In this case, only females, but not male employees were required to have their hair “teased, curled or styled,” and to wear stockings, nail polish, and makeup that included lip color. But one of their female employees, Darlene Jespersen, never wore makeup and she did not comply with this appearance policy. She complained that the policy stated a different requirement for men and women, and was an unequal burden for female employees. Did not suffer? There were probably no men in that court! Long hours of manicure, curling and coloring your hair, and taking care of your skin and makeup, dieting and hitting the gym are not only time and money burdens on women but also an unnecessary requirement that –in my view–, “sexualizes” the image of women at work. The Jespersen v. Harrah’s Operation Co., where the Ninth Circuit upheld a Title VII challenge to an employer’s “grooming and appearance” code continues to receive attention in the legal and non-legal press and generated renewed interest among practitioners on the issue of gender and appearance in the workplace. Does your employer have an appearance policy? Tell us about it and let us know how this policy affects you and your co-workers, or what your co-workers really feel about it! We are also looking for contributors to talk about appearance in the workplace. Please contact Susana@latinasinbusiness.us if you have a blog related to this topic and would like to share your content with us. https://i0.wp.com/latinasinbusiness.us/wordpress/wp-content/uploads/2014/10/dollarphotoclub_makeup2.jpg?fit=675%2C450&ssl=1 450 675 Susana G Baumann https://latinasinbusiness.us/wordpress/wp-content/uploads/2018/02/Logo-black-LatinasinBusiness.us_-675x205.png Susana G Baumann2017-11-29 05:05:052018-02-25 17:15:59Makeup in the workplace, can your boss tell you what to wear?